I knew I couldn't just sit with my new vintage fabric for too long, so these skirts eeked their way to the top of the crafting list this week. I'm digging my serger for making clothes--wow. And Bravo for the rolled hem! I think I like this one so much because I can wear my orange shoes with it! And Amy is totally right--this fabric is calling out for a matching bag, don't you think? Updated to add: Sorry for the lack of details! 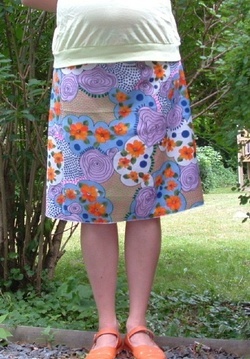 To make the skirt, I traced the shape of a bought skirt (actually, the skirt in yesterday's post!) onto the fabric, cutting two pieces. Then serged those together at the sides, and added an elastic waist. Then I used the rolled hem on my serger for the bottom hem. And voila--a simple skirt! Hope that helps someone!